Linear Air is launching service between Bedford's Hanscom Field near Boston and Teterboro Airport just outside of New York City. "The service is ideal for businesspeople who are seeking alternatives to commercial airlines," said Linear Air CEO Bill Herp. "Passengers with frequent travel needs between Boston and New York will quickly discover that our shared charter model is the preferred way to travel." Herp noted that Teterboro Airport is actually closer to midtown Manhattan than LaGuardia Airport. "The airport is just 12 miles from midtown Manhattan, via the George Washington Bridge or Lincoln Tunnel, so it is ideally located for businesspeople with demanding schedules," said Herp. New Jersey Transit provides express shuttle bus service between Teterboro Airport and the Port Authority terminal one block west of Times Square in midtown Manhattan. Personalized ground transportation at Teterboro will be offered through Linear Air's partnership with premier executive car service provider Boston Coach, a Fidelity Investments company. Service will be offered daily, as dictated by customer demand. Prospective passengers can search for flights and make flight arrangements through Linear Air's website. In conjunction with the service to New York City, the company is unveiling its Linear AirCard, an innovative member card offering discounted travel to qualified passengers. The card will be unveiled on Sept. 21 during a celebration at Hanscom Field for the company, which recently gained its certification from the Federal Aviation Administration. The first 100 qualifying members will receive $500 of free travel credit pre-loaded on their Linear AirCards. Those seeking to obtain the Linear Air Card can visit the company's web site and complete a registration form to determine if they are eligible for the card. "We want to introduce people who have not been charter customers to the concept of private air travel," said Herp. "We think this member card will give incentive to frequent business travelers to give the concept a try. This is, in effect, a discount off of what already is the most affordable private air option available." Unlike most air charter companies that charge thousands of dollars per occupied flight hour in a typical aircraft, Linear Air charges only $750 per hour for its aircraft. 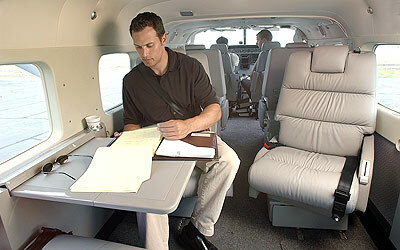 Passengers fly in a brand new Cessna Caravan, an eight-seat executive airplane, which is staffed by two pilots. Passengers using the Linear Air Card will reap instant benefits. For instance, a qualified Linear Air Card holder flying to Teterboro Airport can apply the $500 credit for a free round-trip shared charter flight. Herp noted that cardholders can reload the card in the future at significant discount rates under the company's Fly Buy program. Brad Rosse, regional director of AirShares Elite New England, a shared ownership aircraft company based at Hanscom Field, commended Herp for his business plans to New York City and the member card offering. "I think Linear Air's approach is to change the thinking on air charter with a very cost effective solution for the business traveler," said Rosse. "Their business model is well thought out and well executed. We have referred numerous clients to Linear Air and--without exception--all have been impressed with the high service level and attractive rates." The service is the latest in a series of announcements for the company, which launched earlier this year. Linear Air previously announced service to Cape Cod, Martha's Vineyard, and Nantucket in August and its launch of charter service to more than 200 cities in the Northeast and Mid-Atlantic in July. Linear Air provides short-hop private air travel at airline rates.